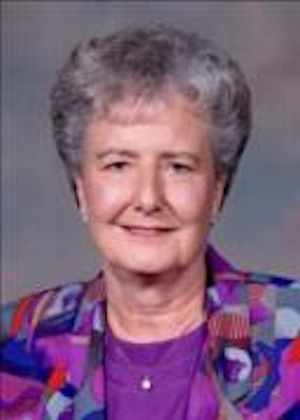 Obituary – Johnson, Isabell Lorena (Thorman) « Perry High School Alumni Association, Inc.
Library Staff ’45-’46, ’48-’49; Red Hots ’47-’48; D. E. Club ’47’49. Isabell Lorena Johnson was born June 29, 1931 in Junction City, Kansas to Harold and Eva (Reed) Thorman. She spent her last days surrounded by her loved ones and passed away peacefully on Wednesday, December 21, 2016 in the home of her daughter and son-in-law Mark and Penny Kuhn. She attended grade school at the two-room Lutheran School in Perry Oklahoma. 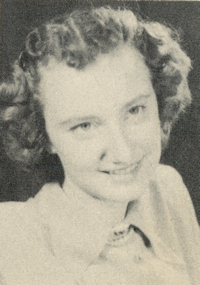 She graduated from Perry High School in 1949. From there she moved to Wichita, KS and worked at Kings Formal and Bridal Shop as a seamstress, and later as a florist at Brown’s Flower Shop here in Perry. She was baptized and confirmed in the Christ Lutheran Church of which she remained a lifetime member. In 1948, She met her best friend and love of her life Bill M. Johnson. Upon his return from the Korean War, they were married July 13, 1952 at Christ Lutheran Church in Perry. This union lasted 58 years until Bill’s passing on July 8, 2010. They lived in Perry the majority of their lives where they raised their three children Mike, Scott, and Penny. Isabell was active in both the Perry Band Boosters and the FFA Mothers Club while her kids were in school. Blessed with a green thumb, she loved caring for both her indoor and outdoor flowers. Her favorite hobby was crocheting afghans to give away to family and friends. She was an avid Nascar fan, especially when it came to Dale Earnhardt. She enjoyed attending many races with family and friends. Her family was her pride and joy. She loved spending and much time as possible with her children, grandchildren and great grandchildren. Even in her final months she could be found reading stories, and building puzzles with her great grandchildren. Isabell is survived by two sons and one daughter; Mike Johnson and wife Dixie, Scott Johnson and wife Kristi all of Perry, OK, Penny Kuhn and husband Mark Kuhn of Jenks, OK. Six grandchildren; Dr. Myriah Johnson and husband Chris Looney of Lindsay, TX, Dakota Johnson of Perry, OK, Kaelee Martin and husband Josh of Bixby, OK, Tate Johnson and wife Lauren of Tulsa, OK, Heath Etris of Tulsa, OK, Shane Etris of Owasso, OK, and six great-grandchildren; Mac and Maebry Martin, Georgia and Kip Johnson, and Charlotte and Rylea Etris. She is also survived by one brother Howard Thorman of McKinney, TX, and one sister Ann Gottschalk and husband Ray of Perry, OK. In addition to her husband Bill, she was preceded in death by her parents and one brother John Thorman. Donations may be made in Isabell’s name to Christ Lutheran Church, the Methodist Soup Kitchen, or Elks Lodge, in care of Palmer Marler Funeral Home, 203 Fir, Perry, OK. 73077.